Feeling stretched? At the end of your tether? A developmental disability is an enduring “forever” type of challenge… not only for the person with the disability but also for family members who are typically the primary caregivers. Without relief, caregivers and families sometimes feel they can’t continue when the demands and challenges become too great. For the family, respite care is a vital safety valve for the pressures of caring full time for a person with a disability. For the person with a developmental disability, respite can be an enjoyable and meaningful experience outside of the family home, fostering social interaction, friendships, and personal growth. At Community Living Hamilton, we offer a variety of respite services, including day trips, overnight stays and cottage vacations. There’s something for everyone! No matter the option, you will find highly skilled caring staff… as well as peace, security, comfort, and safety. While clients are often referred to us through community agencies, many of our respite programs are also available to the general public for a fee. Our Templemead site offers respite for families of adult children who live at home. Our aim is to provide a pleasant and fulfilling experience outside of the family home that enhances or reinforces skills, offers leisure activities that reflect client choice, and fosters social interaction, inclusion and community participation. Templemead is a small group setting located in a residential neighbourhood on the East Hamilton (Rymal/ Upper Gage) Mountain. Templemead offers day visits (9 a.m. to 4 p.m.) and overnight weekend stays (Friday 6:00 p.m. to Sunday 3:00 p.m.). Clients may be funded through a referral from Developmental Services Ontario Hamilton – Niagara Region. Service is also available on a fee-for-service basis. Contact Community Living Hamilton at 905-528-0281. Cost includes accommodation, meals, and snacks during the stay. Day visits $160 per day, weekend stays are $625. Our Charlton site offers respite for caregivers of a child or youth, aged 6 to 21. Your child stays in a group setting in a home-like environment. Our aim is to provide a fun and fulfilling experience outside of the family home that allows for social skills development, healthy friendships, recreation and age-appropriate community participation. Charlton is available when school is closed: on weekends year-round, statutory holidays (except Family Day and Labour Day), March Break, Summer School Break and Christmas Break. Charlton offers day visits (9 a.m. to 4 p.m.), overnight weekend stays (Friday 6:00 p.m. to Sunday 5:00 p.m.) and week-long stays during July and August. Our renovated and fully accessible Leeming site offers day respite for caregivers with a child, aged 6 to 18. Days are filled with fun, meaningful and safe activities emphasizing recreation, crafts, community outings and relationship-building. Service is offered Saturdays and Sundays. This service is also available through a fee-for-service arrangement at $50 per day. This is an excellent option for those families receiving SSAH funding who are hoping to expand the options available to their children. Contact Community Living Hamilton at 905-528-0281. Community Living Hamilton offers planned and regular respite for a family with a child with developmental disabilities under the age of 18. Your child stays in another family’s home for a short-term arrangement, allowing an opportunity for respite for your family. We ensure that alternate care providers can meet the physical, emotional, medical and development needs of your child and we collaboratively develop annual Plans of Care based upon your child’s strengths and desired outcomes for the service. Our aim is to provide an enjoyable and meaningful experience with opportunities to broaden social interactions with peers and adults, develop friendships, enhance or reinforce skills through naturally occurring learning opportunities and participate in age-appropriate, community-based recreation and leisure activities based upon the child’s interests. For information about becoming an Alternate Care service provider, please contact Community Living Hamilton at 905-528-0281. Community Living Hamilton offers staff-supported vacations for clients at our lovely cottage on a lakeside property (Camp Brebeuf) in Rockwood, ON. This provides respite for caregivers as well as a fun and meaningful vacation for up to 6 clients at a time, ages 18 and up. Our energetic qualified staff provides camp activities that are age appropriate and person-directed, including day trips, swimming in the lake, canoeing, campfires, and games. 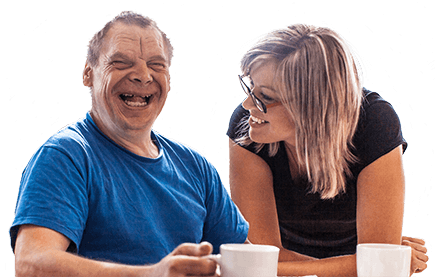 Our aim is to foster relationships and social inclusion, support physical health and well-being, enhance activities of daily living skills, and support the care needs of our clients. Dragonfly Lodge client visits are funded in part by the United Way Halton & Hamilton. Client fees are $325 for a weekend, $750 for 5 days or $1075 for 7 days. Contact Community Living Hamilton at 905-528-0281 for a registration package.